After a short snorkeling phase we dive down and reach a plateau in southern direction. Constantly diving along a wall, passing lava edges, we reach the area with the crosses on a plateau of approx. 18 meter deep. In the year 1570, 40 Jesuit missionaries came to Puerto Tazacorte with their ship, because they were pursued by French pirates. Believing to have succeeded in shaking off their pursuers, after a short stop, they continued their journey, which ought to take them over Santa Cruz to South America. But the pirates had only hidden themselves and somewhere between Punta Larga and El Faro, the missionaries were captured and killed. In the year 2000, 40 stone crosses were lowered into the sea in memory of the missionaries, who have been beatified meanwhile. 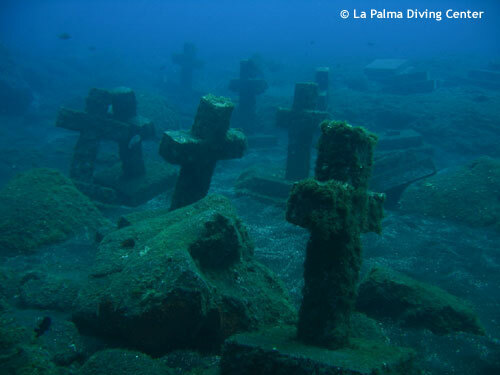 Native people also believed that these crosses could soothe the ocean, which occasionally can be quite uninviting here. For the hope of canonization of the missionaries, La Palma needs some more miracles which are still being looked for by active believers.